Ground floor bedroom adapted for those with disabilities. Located in the Tea Valley (Condado de Tea) which is a sub-zone of the wine region D.O. Rias Baixas. 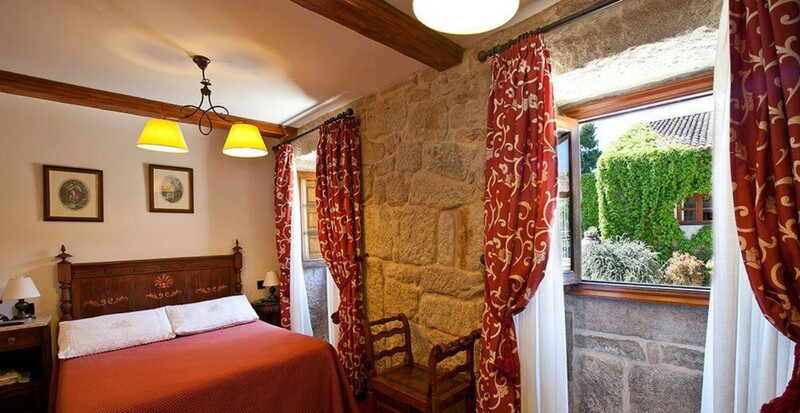 This charming B&B is a fully renovated 17th Century Noble Galician Pazo “Manor” where in every corner it is decorated with tasteful antique furniture that keep in the lines of the history of the property. A traditional atmosphere overlooking the vineyards with the Miño River and Portugal on the other side as your backdrop. 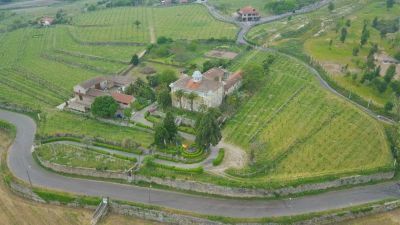 An excellent base for touring the regions wineries, and the owner would be glad to show you his boutique winery and of course tastes his wines that you will enjoy with the local traditional cuisine served at the meals in the dinning room. Wholesome country style traditional slow cooked cuisine. Warmth in every room, each moment is intimately comfortable.There is a distinctive in its atmosphere in tune with needs and tastes. Its distinction lies in particularities, in the joy of small wonders. Relaxing spaces to be enjoyed while being looked after. A True Heaven for Wine Lovers looking to explore a less-known area of Galicia, Northwestern Spain. 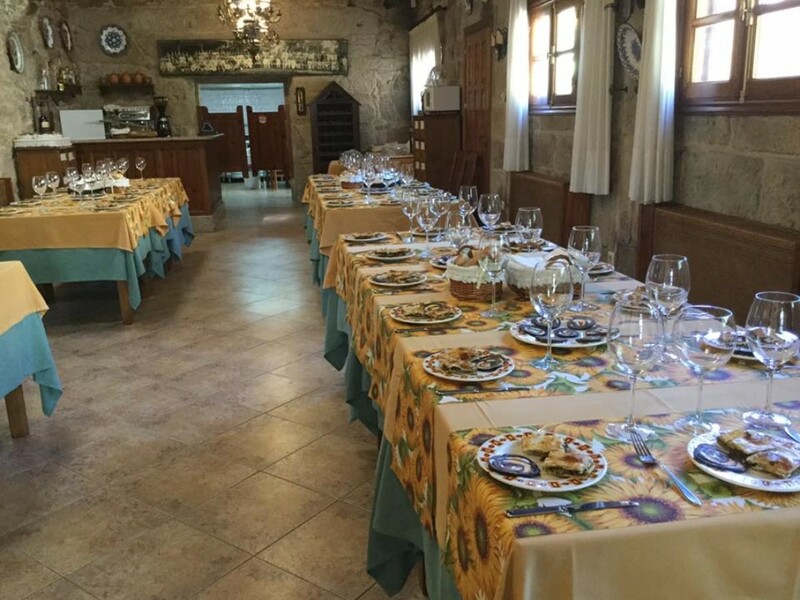 If you are looking for a unique place to celebrate special events, Casa Grande La Almuiña has all the requirements to ensure a special meeting in a natural and peaceful place. Our restaurant has seating of up to 50 people and have an additional lounge for up to 35 people. For events with more people we offer the possibility of renting an outdoor tent, ideal for large banquets. Our traditional cooking is specialized in typical dishes of the Miño river. Our specialty, how could it be otherwise, is lamprey, in all its varieties. You can taste it, in the fishing period, from January to May. Our restaurant also offers the possibility to taste delicious meat, fish and seafood from Galicia. And for days of recollection and cold over a traditional Galician stew. Some days you only live once, and we always remember that you are surrounded by the magic that surrounds the celebration, family, and the environment. 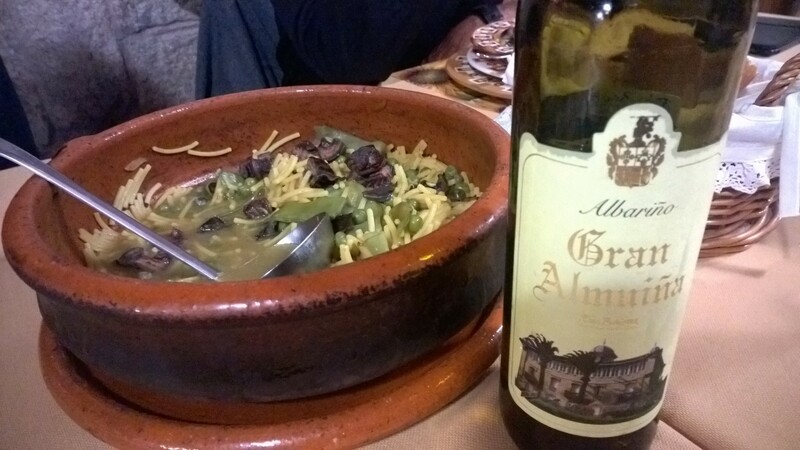 Casa Grande La Almuiña has all the ingredients to make your celebrations have the best frame for your memories. A beautiful natural setting, a large space for the recreation and enjoyment of the guests, but above all the possibility of having all the necessary elements for a perfect day. If you are looking for a private place to combine business-work area, accommodation, restaurant, and leisure; Casa Grande La Almuiña is the ideal place for your event or conference to be made in one place, avoiding the stress of big cities. We have a multipurpose room that can adapt perfectly for your events. Presentations, conferences, lectures, professional meetings or just a business trip combined with the enjoyment of the natural environment on this side of the Miño river. In 1665, Pedro Estévez de Puga married to Francisca Méndez and landowner in the district of Beade and of the Almuiña properties, builds the Capilla del Buen Suceso (chapel of Advent) in Almuiña de Abajo remaining as its protector. In 1678, Don Pedro´s seven succesors divide the inheritance and Jacinto Estévez de Puga, parish priest of Santa María de Arbo (St. Mary´s of Arbo) is a assigned the vineyard including the wine cellars that can be seen from the house. On an inside door beam there is an engraving “Jacinto Estévez de Puga 1675” indicating the constructive evolution of this house set high on a hill overlooking the other homesteads. There are two dominating families; the one from Almuiña de Abajo establishes blood ties with the Vieytez, a noble family from a homestead in Sela, and the other from Almuiña de Arriba with ties to the Rivera and Giráldez families. 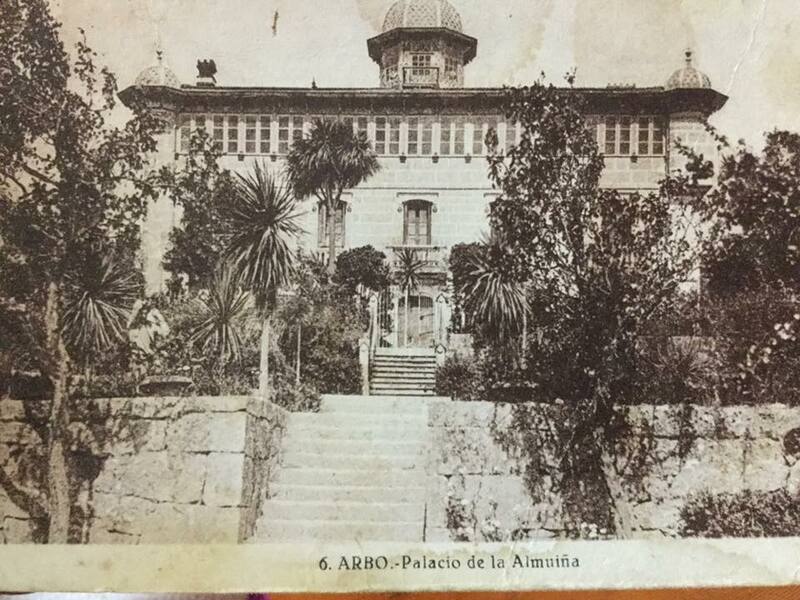 Ignacio Vieytez Tapia (1817-1882), magistrate, president of the Supreme Court and Secretary to Isabel II, acquires the properties of Almuiña de Arriba in 1869 thus uniting the two Almuiñas once again. In the nineteenth century the Manor undergoes an important renovation affecting balconies, windows, dome and other features. Its foundations belong to the seventeenth century. In the XXI century, the year 2002, the living quarters, halls and dining rooms are updated. The Manor´s views over the Miño river, Portugal and the mountains of San Fins (St. Fins) together with the “horreos” granite stone granaries raised on pillars exclusive to the region, the wine cellars, 60.000 square metres of vineyards, early Roman buildings and mines, and fresh water wells make Arbo a place worth visiting. From the heights of San Fins in the county of La Guardia, one can behold the spectacular view of the valley ending at the mouth of the Miño river as it flows into the Atlantic ocean. Further down one can imagine the legendary Romans placed at intervals along the river keeping watch over the “pesquerías” bountiful in lamprey, shad and salmon. With Portugal al the end of its crossing, International bridge offers panoramic views of rapids and still waters, walkways and beaches. At certain times in the year one can enjoy water sports like canoeing and rafting. 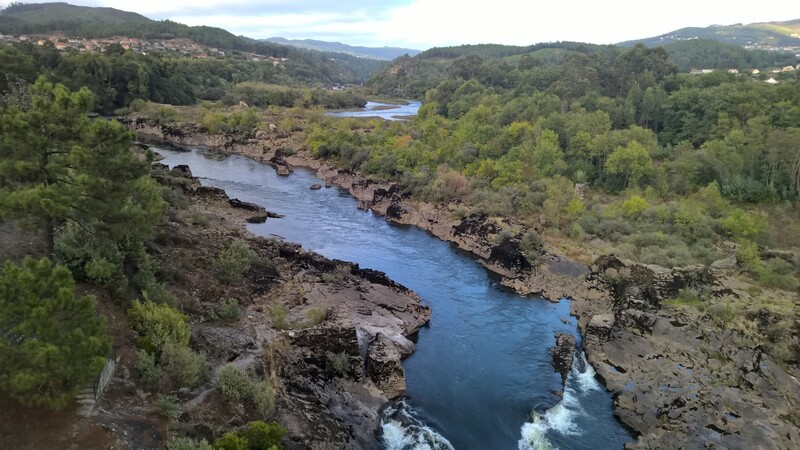 Along the Devo river, an affluent off the Miño, there are bright walks to be enjoyed through woodland, an old Roman bridge, windmills, and a monolith commemorating a battle against the French in 1809 to be seen. There are swimming sports, and an eight kilometre trek called “Sendeiro da Moura”. It is pure paradise. The area has installations for sport and cultural events including an extensive library, an arts center, cinema, sports pavilion, tennis courts, music bands, a polyphonic choir, and other cultural clubs. The Lamprey Food Festivals is held on the second last Sunday in April and the Cured Lamprey Food Festival is held on the first Sunday of July. On the first day of August there is a gathering at San Fins and on the third Sunday in August the Local Liquor festival is held.